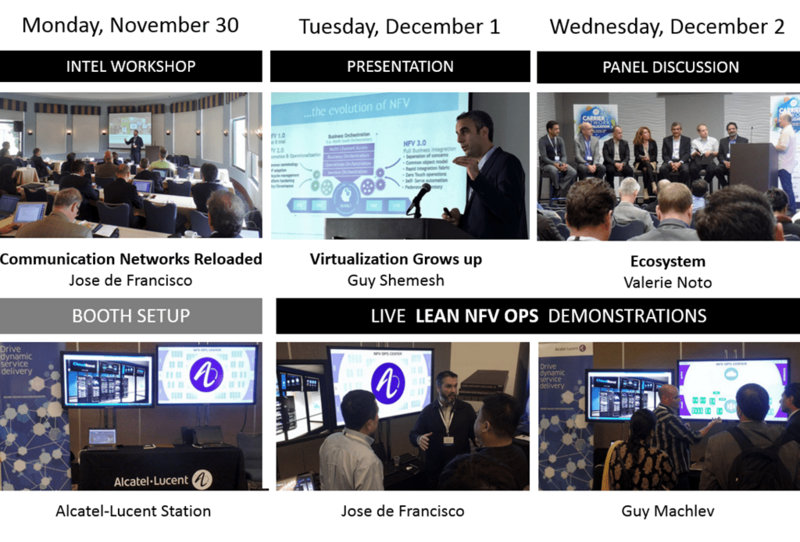 This turned out to be another intensive year (more on that in my next post) and the above pictures capture our team’s presence at Carrier Network Virtualization, the last public event on the Lean NFV Ops program for 2015. I like to thank Christie Rice for her invitation to present at Intel Network Builders Summit in Palo Alto, and couldn’t be happier to hear that my presentation, Communication Networks Reloaded, was well received (see slides below) by the workshop participants. I would also like to thank Sue Morehouse with our Events Team and Andy Mast at the Cloud Innovation Center for all the work that went into getting our team organized for CNV15. Lean NFV Ops: Communication Networks Reloaded @ Intel CNV Workshop. Lean NFV Ops @ Carrier Network Virtualization 2015. “This workshop will focus on the Intel Network Builder Fast Track program pillars – optimization, interoperability, and integration – which align to some of the key challenges the industry faces as we transform the network. Presentations by Intel and many of our ecosystem partners will focus on successes and how to work together to resolve some of the remaining challenges. High level agenda topics include: solution optimization success stories, solution blueprints and integration success stories, interoperability challenges and standard benchmarking efforts. And, don’t forget to join us for drinks, appetizers, and conversation at the networking reception at the end of the day 5:30pm – 7:30pm. 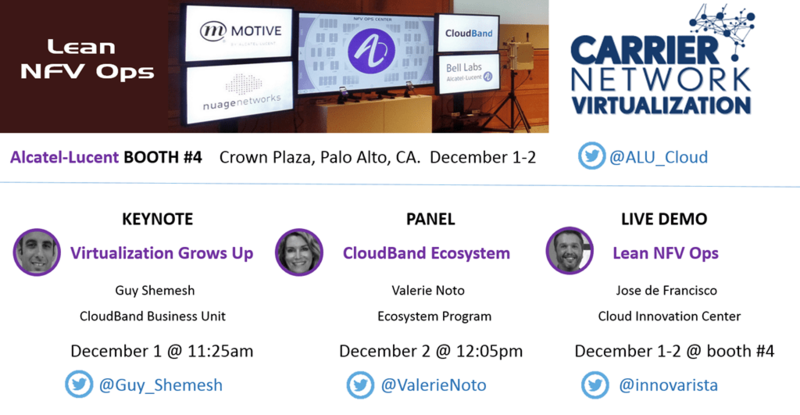 For further information, or to register for the Intel® Workshop & Network Builders Reception, please contact Owen Lochner.” – Carrier Network Virtualization, Crowne Plaza, Palo Alto, Monday November 30th 2015 from 1pm-7pm. Abstract: Innovation is prompting a new wave of dynamic and contextual communication experiences. These are based on fast evolving cloud applications whose growth is placing relentless demands on service delivery and network performance. Basic expectations on agile service launch and effortless lifecycle management are challenging conventional architectures and business models, which are now commonly referred to as “legacy”. Equally important, the Present Mode of Operations (PMO) and siloed organizational behaviors can impair new capabilities. Network Functions Virtualization (NFV) involves a set of emerging technologies and has been the subject of numerous Proof of Concept (PoC) projects to date. Shifting to production environments and “going live” faces new chasms that can be crossed with end-to-end service level orchestration and by adopting and evolving “Lean” design and operational practices. This tech talk discusses findings and insights from the “Lean NFV Ops” program at Alcatel-Lucent’s Cloud Innovation Center (CIC), which this year alone has interfaced with 1,500+ industry representatives worldwide. Bio: Jose de Francisco is a Director at Alcatel-Lucent’s Cloud Innovation Center (CIC). His experience in the high tech sector and software business includes leadership responsibilities in product line management, partnerships, marketing and strategy. Jose has worked with Bell Labs on next generation mobile platforms and holds three patents. He is a Member of the Advisory Council at MIT’s Engineering Systems Division and the recipient of an MBA in International Marketing and Finance from Chicago’s DePaul University as a Honeywell Europe’s Be Brilliant Scholar. Jose also holds a postgraduate degree in Human Factors Engineering from Barcelona Tech and his endeavors can be followed on innovarista.org and @innovarista.